Housing providers from South Liverpool Homes to Peabody partner with Britannic because our team delivers innovation in tenant service, operational performance and work culture with smart contact centre technology. Join Britannic and discover how you can lay the foundation for fast, personal customer interactions through digital service channels, self-service options and workflow automation in the contact centre! The new contact centre solution has allowed us to monitor and measure our calls, increasing our visibility...and providing us with information we didn't have before. The amount of data we can glean helps us with performance evaluation, forecasting, planning and monitoring. 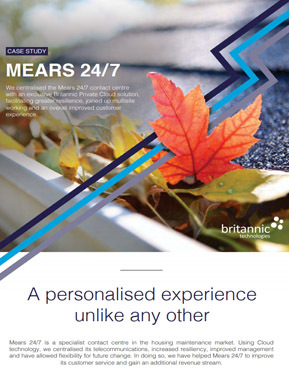 We centralised the Mears 24/7 contact centre with an exclusive Britannic Private Cloud solution, facilitating greater resilience, joined up multisite working and an overall improved customer service experience. Working with Britannic, you open the door to innovative contact centre solutions, reliable solution delivery and generous ICT knowledge transfer. To give you the best solutions and support, our vendor-accredited team works closely with market leaders, including Avaya, Mitel and Microsoft as well as Orchard Systems and Capita. On top of strong vendor relationships, our own work processes are underpinned by ISO industry standards, ensuring the consistently high quality of our services, delivery platforms and information security management. That means, your contact centre solution and services are in safe hands not only on paper – but in practice. Move tenant interactions into digital communication channels to improve response and tenant handling times with a scalable multichannel contact centre platform. In line with your requirements we replace or develop your existing platform, and help you move to the cloud, too. Connect agents to the back office for quick access to tenant records and advance intelligence on the telephone with CTI, CRM integration and contact centre links into your housing database. Offer live assistance right on your website with real-time web, chat and video applications that allow you to partly or fully automate repetitive customer responses, and help you to speed up agent/tenant interactions online. You could even deploy an AI agent to free up your employees for the most complex cases. Ami is a revolutionary Conversational AI that acts as an agent and customer service representative. She learns from having real conversations with tenants. Ami responds fast and accurately to customer requests and can be deployed on your website as a first touch point to identify customers, or as a standalone digital agent that fully handles standard transactions on her own. Using natural language, Ami blends in with your contact centre team and complements their service capabilities. Are you ready to hire your first digital agent? Download the product sheet to learn more about the way Ami works. Together with your team, we discover the contact centre platform, applications and network technology that fit your organisation’s needs and work style. We demonstrate the technology and run pilots, so you can get buy-in and try before you buy. Our vendor-certified engineers and IT developers design your integrated contact centre solution. Your dedicated Project Team deliver the solution when, where and how you want it. On spec and on budget. As your technology partner, we proactively manage and maintain your system, and develop your contact centre solution as your organisation evolves. Meet our team in London or Manchester this summer to explore our contact centre solutions, to see new digital service applications and to discuss your contact centre project with our specialists! Discover what your contact centre is capable of. Book a Discovery Session! At our Contact Centre Discovery Workshops we bring together your Senior IT and Business Executives together to rethink how your contact centre could drive better customer experience. Together, we identify areas for improvement in your current contact centre, explore available technologies and draw up a development plan that allows you to transform your operation at a pace that suits you.